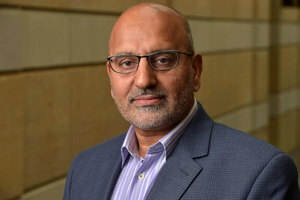 Sensational reporting and commentary must be avoided in the wake of the recent murders of three Muslim college students in North Carolina, according to Ebrahim Moosa, professor of Islamic studies at the University of Notre Dame’s Kroc Institute for International Peace Studies. Moosa observed that “often sensationalized media reports and protests hold all versions of Islam and all Muslims responsible for acts of terrorism and the inhumane actions of the Islamic State of Iraq and Syria. It takes very little for certain individuals to avenge these deaths on behalf of their nation or race, as was the case with the Norwegian mass murderer Anders Behring Breivik. Now it appears that Craig Hicks, arrested in the North Carolina shooting deaths, might have been motivated by hate and executed three Muslim college students who were his neighbors. “Clearly reports of the death of Kayla Mueller, the American hostage in Islamic State captivity, and the heinous blood-letting of hostages by Islamic State encourage depraved modes of thinking in individuals who act as lone wolves worldwide." Moosa, author of “Islam in the Modern World,” specializes in Islamic thought, with a focus on Islamic law, ethics, history and theology. He also co-directs Contending Modernities, Notre Dame’s global research and education initiative examining the interaction among Catholic, Muslim and other religious and secular forces in the world. Originally published by Michael O. Garvey at news.nd.edu on February 11, 2015.